Things to do in Tasmania - Australia's Smallest State. How much time is needed to tour Tassie? Cape Pillar – The Big Hike! Strathgordon and the Gordon Dam plus Scary Abseiling! Find some quirky accommodation places on Air BnB. Tassie is packed full of things to do for couples, groups, families and solo travelers. Attractions – man-made and natural – are around every corner. The most incredible wilderness areas can be accessed, some of the best beaches in the world to explore and incredible history, that is both grim and remarkable. Tourism is one of the main sources of income for the island and the government clearly promotes every natural attraction. Tassie has a population of around 515,000, that number grows significantly in the peak tourism seasons. Whether you are on a self-drive holiday or have opted for one of the Tasmanian holiday packages on offer – expect to be surprised and thrilled with what Australia’s island state offers. Our map of Tassie has many the places marked for easy reference. Did you know that it is possible to see the Aurora or Southern lights from Tassie? Join the Aurora Australis Facebook group if you are interested. Find the best places to view the Southern Lights in this article and drool over some awesome images too. There is plenty of accommodation to choose from in Tasmania, unusual and spectacular places to stay as well as campgrounds – both free and paid. Download and use the Wiki Camps AU app to find the best camping and caravan parks on the Island. Four weeks at least. Six weeks would be better… even if your holiday was for a few months, there would still be so much to experience. The island has many stunning National Parks to explore. A grand tour of Tasmania can be completed in 10 days, seeing the highlights and experiencing the best of the island. Although, just to cover the incredible things to do that we have listed below, would take at least 30 days! Do not think of Tassie as being small enough to drive around in a few days! We managed to cover over 5,000 km’s during a 5-week camping trip. That was not expected at all. This list starts in Launceston, in the north of Tasmania. It then goes off down the Tamar Valley and does a clockwise circuit of the island. 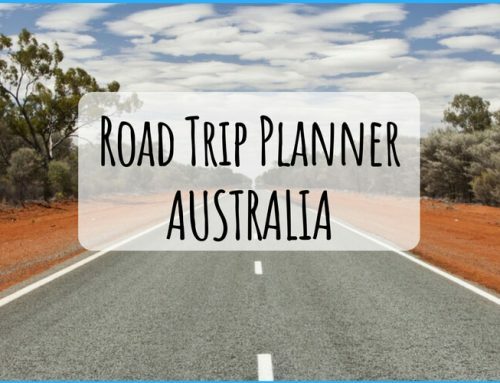 This will help ‘explorers’ to plan their own trip to this awesome part of Australia. 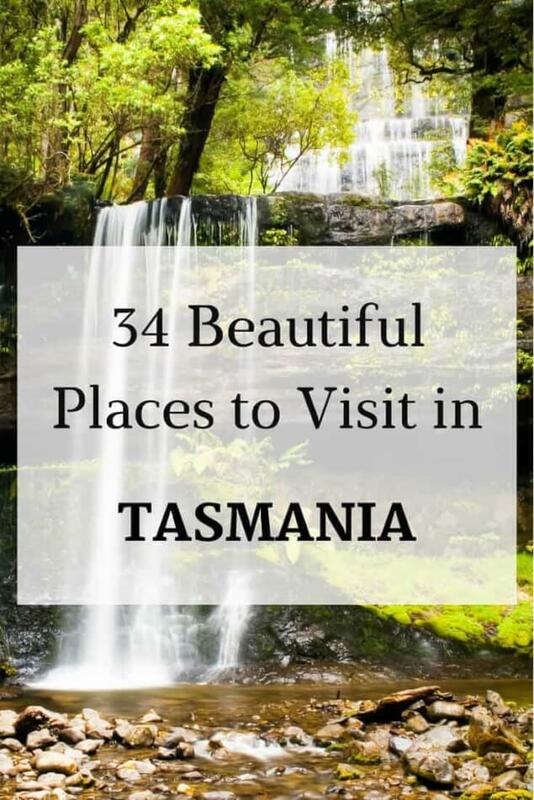 This list of the top places to visit in Tassie does not include the beautiful Flinders Island or King Island, they would require even more time to tour. Launceston is a pretty city with plenty to see and do. 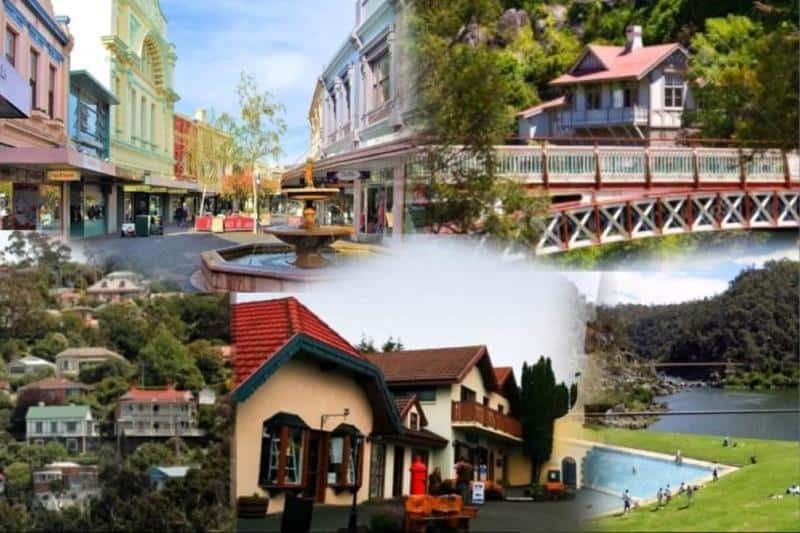 Cataract Gorge is one of the favorite places for locals and visitors alike. Great swimming, pretty walks, and a scenic chairlift. One or two days will be enough time to see Launceston. A day trip (or longer) down the Tamar Valley is a must. Stop at Brady’s Lookout, named after one of Tasmania’s naughtiest boys, Bushranger Matthew Brady. Wineries are established on both the East and West Tamar. There is nothing prettier than a drive along the Tamar on a glorious still day when the reflections are at their best on the river. Drive down along the West Tamar, follow the old road beside the river at Rosevears and continue along past Deviot and across the Batman Bridge. Beaconsfield, Georgetown, and Lowhead are all interesting places to visit too. A full day or two would be ideal to see this area. From Georgetown all the way to the topmost North-Easterly point of Tasmania there are gorgeous beaches, forest walks, waterfalls and plenty to see. Bridestowe Estate Lavender Farm is one of the most popular attractions. The name sets the imagination racing from the start. Tassie scenery does not get much more amazing than at Binnalong Bay and the Bay of Fires region. 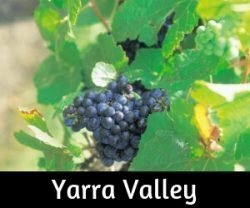 The images on the website will have anyone heading to this destination, a long-time holiday favourite for many Tasmanians. Plenty of free camping options as well as holiday homes. The bay was named in 1773 by Captain Tobias Furneaux, who saw fires that the Aboriginal people on the beaches had lit. It is commonly thought the name derived from the stunning orange lichen on the rocks. Loads of rock hopping to do here! Another iconic Tasmanian destination! The world-famous Wine Glass Bay with clear blue waters, white sands and fabulous walking tracks…. go here. Don’t miss it off your list! Nearby Friendly Beaches is an awesome spot too. 20 kilometers long, located in the Tasman Sea, rugged mountains and oozing with convict history. Maria Island is well worth adding to the Tassie adventures list! This is a place that needs little introduction. Some of Australia’s saddest historic events occurred here, now a UNESCO World Heritage site. “Follow the history of Port Arthur, from timber camp to a prison at the forefront of criminal reform methods, right through to a world-class tourist destination”. While in the area, visit the Tessellated Pavement, Devils Kitchen, Blowhole and local beaches of the Tasman Peninsula. PS BEST EVER Fish and Chips at the blow hole! A mobile van called ….’Doo-Licious’ was at the blowhole and they were awesome! We just had to include this hilarious little town, not far from Port Arthur. From its beginnings in the 1930s, consisting of holiday shacks (holiday cottages), a local Architect named his shack ‘DOO I’ and the idea struck others as a novel naming and so the trend caught on with many ‘Doo’s’. A great giggle and plenty of photo opportunities! A boat cruise around the famous Cape Pillar, or even a helicopter flight, definitely should be included in your visit to Tassie. A spectacular region that worth seeing from sea level. The Three Capes Track is an organized trek for small groups with accommodation and food provided. It is costly but rather spectacular. The Three Capes walk is not open to the public. It is possible to walk to Cape Hauy, described as one of Australia’s best day hikes. Self-guided or through a tour company, this walk is spectacular. This post is coming soon – well, as soon as we have done the hike! Heading towards Hobart, a detour to all the little coastal towns and up to Richmond is rewarding. The Richmond Bridge is heritage listed. The arched bridge is 25 km north of Hobart. It is a beautiful town and the bridge has a couple of claims to fame – the oldest bridge still in use in Australia and the oldest stone span bridge in Australia. Well known for the Salamanca Market and New Year’s Eve celebrations as the Sydney to Hobart yacht race finishes, Hobart is a great city to visit. Be sure to go to the top of Mt Wellington for superb views. Mt Wellington is very popular, try to get there as early as possible when it is quieter! The Royal Tasmanian Botanical Gardens are also a great place to visit, perfect for some quiet time. The T.M.A.G is definitely a place to add to an itinerary when touring Tasmania. The Aboriginal Heritage information is confronting, honest and may be overwhelming to some people. It is a disgrace that the majority of Australians are not taught the honest facts about our past in schools. A stunning building and definitely worth a visit. Free admission for under 18’s and Tasmanian residents, otherwise there is a charge of $15 – $28. The website is rather ugly to use, IMO. I’ll confess to not actually being huge fans of galleries and some parts of this one left me wondering about ‘what is art’? Hmmm… see for yourselves. Tasmania is becoming well-known for viewing the Southern Lights and has some excellent vantage points. Read a complete guide on where and when to view them here. What an absolute treasure this little island is! Beaches, history, wildlife, super accommodation and stunning camping spots! Take the ferry across from Kettering, about 40 minutes drive south of Hobart. The crossing is not overly expensive and the experience is priceless! Be sure to see the Little Penguins at the reserve on ‘The Neck’. A local guide is often there to give a presentation about the little birds and it’s free. Visitors need a car or to be on a tour to see the island properly. A few days can easily be spent here, especially for anyone keen on bush walking. A trip to Tassie would not be complete without a drive through the Huon Valley. 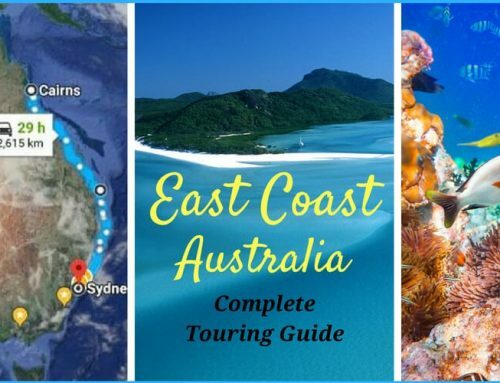 A stunning region with so much to see and do: Incredible wilderness walking tracks, jet boat rides, The Tahune ‘Airwalk’, wonderful Cockle Creek at the very end, Hastings Caves and the Thermal Springs…. We enjoyed the warm thermal pool at Hastings Caves – it is a blue swimming pool fed by warm springs. The caves are great too. We were left disappointed by the Tahune Airwalk – an awesome structure and great views, though really pricey for what it is. 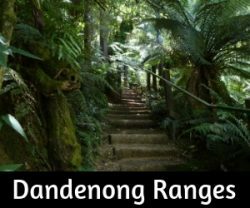 Massive trees, the famous Russell Falls, and some stunning walks. 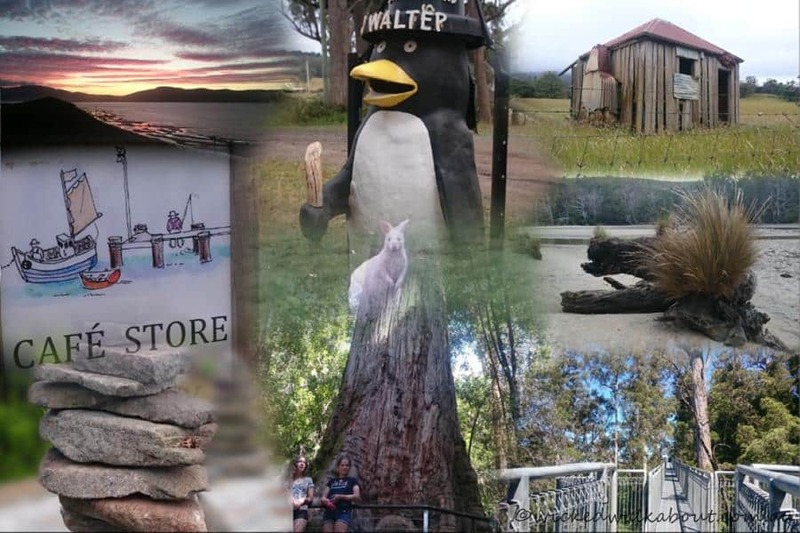 Along with a top campground, Mt Field is well known and loved by Tasmanians and visitors to the Island. The Styx Valley of the Giants is less than two hours drive from Hobart and home to some of the tallest trees on Earth. For years, it was one of Tasmania’s hottest conservation battlegrounds, with patches of its giant trees logged against the best efforts of environmentalists. In 2013, the logging stopped and the Styx was finally given the recognition it deserved, protected as a formal reserve and added to the Tasmanian Wilderness World Heritage Area. Now, the Styx offers a unique visitor experience. 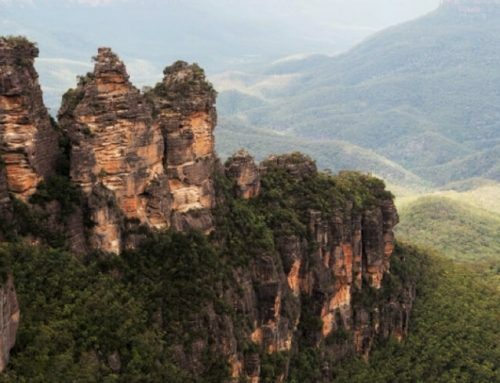 Free from the backdrop of conflict, controversy and destruction, visitors can explore the myriad of walking tracks throughout the valley and walk among ancient rainforests, towering eucalypts and along a wild, free-flowing river. Read more about the self drive & walking guide on the Wilderness Society website. The Gordon Dam wall is 132 metres high and was built in 1974. Abseiling down the wall is an option for the brave… I as hoping to book the kids on as a surprise for them… but it is for 18 and over only. Shame. Be sure to see the 2,000-year-old Huon pine stump at Pedder Wilderness Lodge, near the dam wall. We enjoyed staying at one of our favourite free camps down this way at Edgar Pond on the Scott’s Peak Road. There is a smashing little walk on the road in called the ‘Creepy Crawly Walk’ – don’t miss it! Lake St Clair is at the southern end of the world-famous Cradle Mountain-Lake St Clair National Park and is part of the Tasmanian Wilderness World Heritage Area. Lake St Clair National Park is awesome. Bushwalking, cruise on the Lake and the end of the Overland Track from Cradle Mountain. Learn about the Franklin River history and preservation protests on a short walk or immerse yourself in a whitewater experience! An absolute must on any Tasmanian holiday itinerary. River cruises, wilderness, the raw beauty of Queenstown – so much to see. A family-owned company – since 1896! We highly recommended boarding one of their cruises when visiting the South West. On a still day, the reflections in the Gordon River are stunning. Cruises go across Macquarie Harbour and out to the entrance of the harbour before plying their way up the river… Read more on their website. 11 km north of Strahan (on the Zeehan road). Huge sand dunes, fabulous for tobogganing! Toboggans can be hired from a few places in Strahan or take your own… boogie boards maybe. The Tarkine is a special place to visit. “The 447,000 hectare Tarkine Wilderness Area is Australia’s largest tract of unprotected temperate rainforest and it contains vast forests of myrtle, leatherwood and pine trees. It is home to one of the greatest concentrations of Aboriginal sites in Australia. Almost all The Tarkine’s 447,000 hectares is alive with snakes, frogs, birds, 28 different mammals, endangered wedge-tailed eagles and the now rare Astacopsis gouldi – the world’s biggest freshwater lobster. “. Allow plenty of time to visit this unique area. Walks, massive trees, wildlife, camping, accommodation, canoeing, and a giant tunnel slide! Nearby Corinna is a speck of a village that deserves to be on your holiday itinerary too. A step back in time, with a Wilderness Experience accommodation option. The core of a volcano, 152 metres high. The Nut stands out like a sore thumb on the northwest coast of Tassie, by Stanley. Designed and manufactured in Austria, the chairlift takes folks up and down or you can walk. We recommend walking one way at least… just depends on whether you prefer going up or down! As a child growing up in Tassie, we went up the Nut, scaring the daylights out of our mother by going as close to the edge as possible… so, watch the kids at all times! 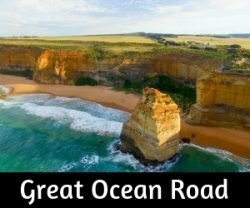 So many fabulous spots to visit as you cruise down the coast. We loved Boat Harbour Beach and all the little villages along the way, also the town of Penguin with it’s colony of little Penguins as well as a big penguin sculpture that graces the main entrance to the town. One of Tasmania’s most famous natural attractions and the start of the 7-day overland track. Fabulous walks, Dove Lake circuit being one of the most popular, plus many more of varying difficulty. Watch for little Tasmanian Devils, stay in a lodge, camp or book a cabin. The first mural in the little town was unveiled in 1986. Follow the history of the region in pictures as you explore the town. Plenty of accommodation options such as the Carinya Farm Holiday Retreat. With 8 mazes, Tasmazia is reported to be the largest maze complex in the world. The village of Lower Crackpot is, well, a crack up. A great day out for the whole family in an area called the Promised Land. One of the prettiest waterfalls in Tasmania. One the slopes of the Great Western Tiers. A friendly debate is ongoing as to the prettier of the Falls – Liffey or down south the Russell Falls, in Mt Field National Park. The Lakes region – Famed for world-class fishing and stunning scenery. Plenty of caravan and camping sites in the region. 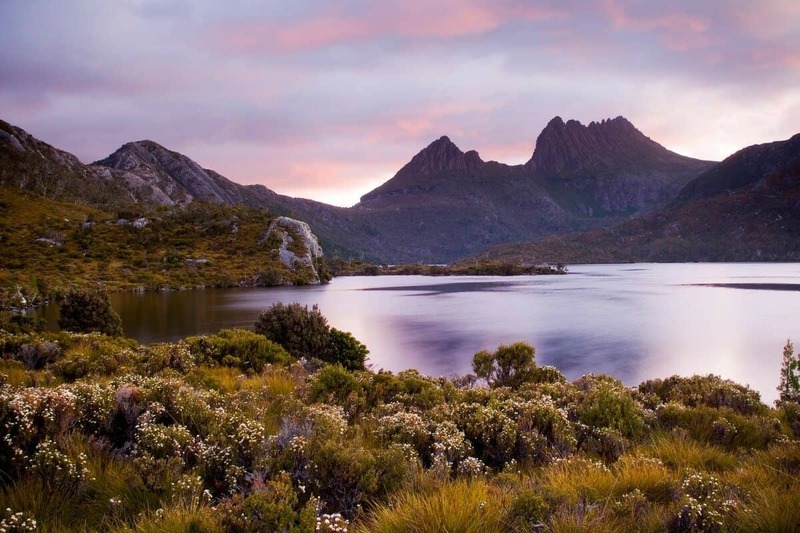 A tour of Tasmania is not complete without visiting the Highlands and Lakes region! Wildlife Parks – Tassie has a few excellent parks to choose from: Bonorong Wildlife Sanctuary near Hobart, Tasmania Zoo in Launceston and Trowunna at Mole Creek (near Cradle Mountain). All the parks have good reputations. An overnight or day trip on the ‘Spirit’ is an exciting way to reach Tasmania. Justine, from ‘Our Family Getabout’, wrote a brilliant post on all the details of booking and boarding the ship with a caravan and ‘life on board’. Try to book early to get the best fare. If you do a search and wait to book, the price may go up. Also if you have already done a search for fares and then come back later to book – the nature of the internet means that your visit will almost certainly be tracked and the price increased because of this tracking (happens all the time on the web). Clear the cache/history on your device before booking so the ‘cookies’ are cleared. Either use an incognito browser window for searching in the first place or for when booking. Or … Be super paranoid and book from a totally different computer! This applies to booking airfares etc. too. We took our fur baby with us when we went to Tassie. The way over we ‘dutifully’ put her in the kennel on board. And hated leaving her there. They were clean and safe, but just horrid to leave a little dog scared in the noisy bowels of the ship. A bit of ‘googling’ and I saw that they are not compelled to be kenneled at all. On the return voyage, we asked to keep her in the car. Signed a simple form with no hassles at all and she remained in the car and her own space. Much better. You cannot go to the cars during the voyage though. All the decks are ventilated, it is not a problem at all. When you kennel a dog, the kennels are located on 2 of the car decks, so this means you may be kept waiting in line to board. When dogs are being kept in the car, it means you generally board in the order of your arrival. Day sailings take about 9 hours and night sailings about 12 hours – it would be better to go on a day sailing with a dog, perhaps. Try to be one of the last vehicles onboard to delay the time your dog is confined. It is free to take dogs on the ship, though a kennel costs a small amount extra. A number of airlines service Tasmania and travellers may land in Launceston, Hobart, Devonport and a number of smaller towns too. We love to use Sky Scanner for finding the best airfares, accommodation at great prices and car or campervan hire too. If you are not signed up to Air BnB, follow our link to receive a credit of up to $50 to use on your first stay. Wow, the Tasmania tourism board should hire you. I had no desire to go to Tasmania until I read this. Now I want to go! It is a surprising little place, Ruth. I imagine Explorason could help write some great articles about Tassie! You have certainly covered every great place in Tasmania. There are just so many! We did Tassie in 2 weeks and like you say you really need 4 weeks to do it justice. I will be using this as a guide when I do a return trip. 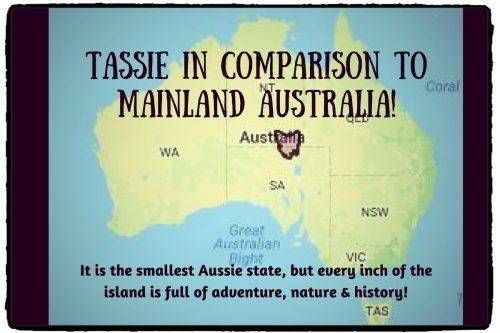 It is incredible how much there is to do when you look at the comparison of Tassie to the mainland. We still missed places that I had on my list… just need to go back again too! Thank you for a very informative and fun website ..I have lots of new ideas got our walking boots on!!!! I’m glad you have found some added inspiration, Di! Enjoy you time in the smallest state with so much to do. 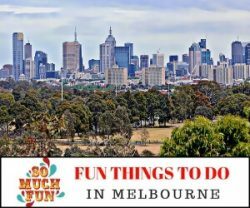 Lots to do in Tasmania! 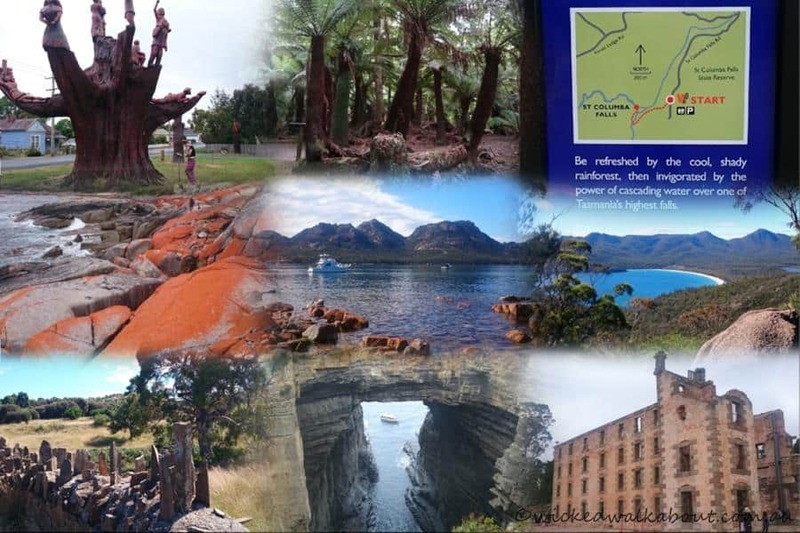 Honestly, I’ve never been that curious about Australia – but have always wondered about Tasmania and judging by photos I’ve seen it looks rugged with lots of hiking opportunities. Personally it would be at the top of my list in Australia.